Dhanurasana (Bow Pose) yoga posture has been named after the shape it takes - that of a bow. Dhanurasana is part of the lying down on the tummy category and is also part of the Backbend series. This powerful pose which looks like a Bow works on all the parts of your back simultaneously. The balancing of the entire body on the lower abdomen makes the body look like a powerful and strong bow. This beautiful pose brings all the stretch that is need to the entire back and works wonders on the abdominal muscles. Learn more about this yoga pose below. Bow Pose is considered a base pose as bow pose variations can be derived from this pose. Bow Pose helps boost energy in the body and hence can be included in flow yoga sequences. 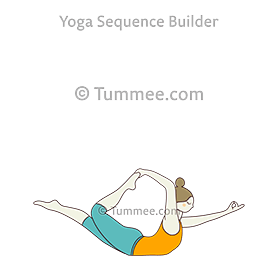 The below cues and yoga sequences added by yoga teachers show multiple ways to do Bow Pose depending on the focus of your yoga sequence and the ability of your students. 1. We did some work to really activate the glute and legs, so when we come to boat pose, we are not compressing the low back. 2. Bend your knees, bring your heels as close as you can to your buttocks. Keep your knees about hip distance apart. - From the resting position after Locust, bring your chin back to the floor. - Reach back with both arms and grab the tops of your feet (first right, than left), with your thumbs pointing toward the floor (or, to deepen the pose, hold the outsides of your ankles and flex your feet). 1. From the resting position after Locust, bring your chin back to the floor. 2. Bend your knees and bring them to hip width. INHALE - Bow Pose - shoulders away from the ears. Feel the pelvic bones digging into the floor. Take Bond Pose two times. End with your cheek to one side on your mat. Take Bow Pose two times. End with your cheek to one side on your mat. The muscles around the Spinal Cord and the Neck are strengthened. The alignment of the spine is corrected. The chest and shoulder muscles are put to work thus making them strong and removing any sagging shoulders. The muscles around the hamstrings , calves and legs are also stretched thus making them strong and toning the. Hence this yoga pose brings in a lot of benefit for Athletes. Brings in a lot of flexibility in the back. As the body weight is on the abdominal muscles, the abdominal organs are helped to function better thus improving the organs like stomach, liver, intestines, spleen and pancreas . This functioning of the organs thus brings balance in the inner body by improving the secretion by the various glands. Helps to treat menstrual disorders in women , thus toning the female organs. Stimulates the nervous system and brings a balance to the nervous system. As the pose has a strong impact on the abdominal area , women who are pregnant should avoid this. Patients suffering from pressure, either Low or High should avoid this pose as it brings a lot of pressure to the abdominal area, thus making breathing a little difficult which can stop the flow of blood to the brain. Any kind of neck injury including someone suffering from spondylitis. Someone with severe back pain or back injury . Too much pressure is on the abdominal area as the entire body is balancing, so people suffering from ulcers in stomach or someone with Hernia should avoid this pose. A lot of awareness of the body while at a particular pose should be had and only a good teacher who has this awareness can bring in light on the yoga pose while doing it in a class. This awareness is essential when dealing with students who suffer from certain ailments and who are looking to heal themselves through the practice of yoga. Bow Pose Variations: Below are some common variations of the yoga pose Bow Pose with base pose as Bow Pose (Dhanurasana). 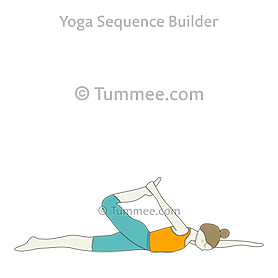 Sign-up to view all 11 variations of Dhanurasana and create your own library of yoga poses to easily and quickly plan your yoga sequences. Start by lying down in Makarasana(Crocodile Pose), where you are in prone position. Here as you are face down bring your arms close to sides of the body and with forehead down, stretch your legs and take few deep breaths to relax the spine. With distance between the knees bend them and point the toes close to you by bringing the legs and feet close to your lower back. Placing the both legs and feet close to your lower back , now try and hold onto your ankles with your hands from behind. Make sure the holding of the ankles of both the legs are from outside. With shoulders and arms now stretched and legs raised behind you from above floor and thighs away from the floor, stay here for a few breaths to ensure the flow of blood is felt. Grabbing the ankles now, raise the entire upper body from the upper abdomen to the neck upwards and balance the entire body on the lower abdomen. Now the body should look like a Bow. Stay in this pose for a few breaths and make sure those thighs are away from the floor. Tighten the buttocks and lower back and pull yourself upwards with every inhalation. Feel the blood flow while in this pose. A slow breathing can help you balance your body longer with eyes closed. Too much of stretching of the muscles in any yoga pose that causes pain will bring injury. 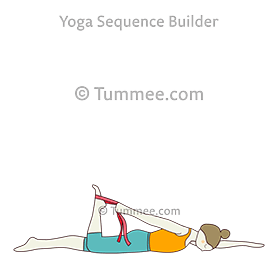 Hence if at any particular yoga pose the stretch is not easy but the body needs this stretch , it can be obtained through improved and modified techniques. No yoga pose gives pleasure and joy if not experienced the right way. Thus there are a few alternative ways to get to this pose if one wants to gain the pleasure of this Pose. Some are mentioned below. If reaching for the ankles is difficult , one can use a yoga strap and place it around the ankles of the feet and with a proper grip pull yourself up by holding this strap. If the pressure on the abdominal area is uncomfortable , you could place a blanket to give you the support just below the pelvic and lower abdomen. An experienced teacher can help in bringing those arms behind to reach for the ankles and support the lifting of the knees and thighs by placing a thin blanket below the knees. One could start practicing this on the flat and firm mattress before coming on to the mat on the floor. The support and the cushion effect will bring lesser pressure to the abs and thighs , thus improvising the stretch. 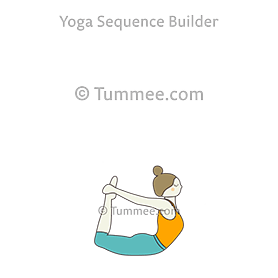 Thus depending on the comfort of the students , variations of this yoga pose can be practiced and learned before getting into the actual pose Dhanurasana. Stretches: As you lie down face down in Makarasana (Crocodile Pose), a few stretches of the legs, ankles, neck , lower back and upper shoulders should be done. For instance, by folding the knees and bringing the feet together you can rock the lower back left and right taking both the legs to one side and placing the feet on the floor. You could also kick alternate legs down and up, beginning to loosen up the thighs and hips. You could also raise your upper body with feet stretched behind you and bring your neck on inner palms of the hands by supporting and relax the spine with a few breaths here. This helps to open up the neck and shoulders. Cobra Pose (Bhujangasana): This Pose where the body looks like that of raised hood of a Cobra, gives the required stretch for the lower back. Lying down with face down, place your palms by bending your elbows close to your upper abdomen near the chest. Taking a deep breathe raise the upper body and bring it upwards and backwards by balancing the body on your wrists feeling the stretch on the lower back. The body is raised from the thighs and the spine is beautifully curved while the neck is taken backwards. Navasana (Boat Pose): In this pose the both extremes of the body is stretched in the air and balancing on the lower abdomen and pelvic giving the stretch to both upper and lower back. Here raise the body from lying face down with arms stretched close to your ears and legs raised from the thighs up in the air at least about 30 degrees from the floor. So here both ends of the body are raised from the floor to about 30 degrees. As the above yoga poses too require working on the back , a good stretching exercises is essential. One can work on doing some stretches under the category of standing and back bends yoga poses. A good teacher will be able to guide the student depending on the level of the student and his/ her experience in yoga practice. A simple rule to follow after any difficult pose is to ensure the muscles gets relaxed the right way. Understanding the impact any pose has on the muscles will help to follow-up immediately with the right kind of sequence of yoga poses for relaxing. 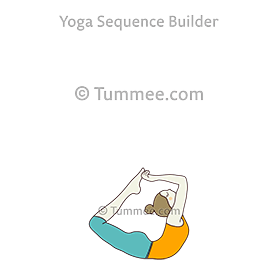 Not all of us have the same body and flexibility and therefore keeping this in mind the sequence will vary. But given below are the standard relaxing poses which can be practiced after Dhanurasana. Adho Mukha Virasana (Downward Facing Hero Pose): The complete stretch of the shoulders in Dhanurasana can be relaxed in this Downward Facing Hero Pose. After releasing the pose from Dhanurasana come into Makarasana (Crocodile Pose), and from here pick the entire upper body and with palms placed close to the chest go backwards and sit on your heels and knees. This pose has the forehead touching the floor and with arms stretched in front. Relax in this pose taking your mind to the neck , shoulders and chest with slow breathing. Uttana Shishosana (Puppy Dog Pose): From Adho Mukha Virasana, pick the body from the lower back and take the chest on the floor. Here the arms are stretched taking them forward on the floor till your chest and chin touch the floor thus making the lower back rise upwards. The pushing of the lower back upwards will help in releasing any tensions around the spine caused from Dhanurasana. Rabbit Pose (Sasangasana): Moving from Puppy Dog Pose, now place your arms behind you and try and reach for both your heels while bringing the head close to your knees. The more you bring the crown of the head on to the floor close to your knees the more the muscles around the neck will be relaxed. Here the lower back is raised upwards and the entire shoulders and chest is got inwards closer to the thighs. Makarasana (Crocodile Pose) / Advasana (Reverse Corpse Pose): Finally relaxing the entire body in this pose is a must. With face down on the floor and arms stretched in front and feet placed a foot distance , completely loosen the entire body ensuring the chest and tummy are pushing the floor while breathing. Back bends surely need the right kind of poses to relax. 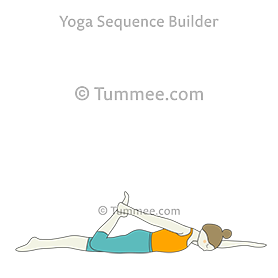 The sequence of the yoga poses (asanas) should go from the easy level to the intermediate level and then to the advance level. So someone who has already reached a good practice with the intermediate level can challenge themselves with the advance level but with the guidance of a good yoga teacher or Guru. Dhanurasana can be classified under the intermediate level of yoga poses, but to get the pose right with breathing, a lot of practice will be needed to make sure the pose is held for longer time. Below we shall discuss next level of yoga poses at intermediate level. The practice of these yoga poses will help to move to the advance level eventually. Ardha Dhanurasana (Half Bow Pose): Though this is a Half Bow Pose and generally practiced before the Full Bow Pose, it may be difficult to balance the body with one leg raised. In this pose both extremes of the body is raised just like in Dhanurasana , but we need to hold just one foot with the same hand and allow the other foot and leg to balance in the air off the floor. The hand which is not holding is stretched forward in front helping to balance the body. The balancing of the body in this yoga pose is difficult and hence considered as the Next Level Yoga Pose. Supta Virasana (Reclining Hero Pose): Much after the Back is bent backwards thus making the muscles around the spine and upper body strong, the body is ready to take the back the opposite direction. Here seated on your knees and on your heels in Vajrasana (Thunderbolt Pose), slowly take the body backwards trying to lie on the floor . In this pose the entire body is lying down, putting some pressure on the ankles and the arms are stretched behind your head. Slowly raise the entire back from the floor upwards and just the shoulders remain on the floor. This stretch where the spine is curved upwards from the floor brings in a deeper stretch to the muscles around the spine thus improving flexibility and improving the nervous system. Purvottanasana (Upward Plank Pose): The next level to bring in strength to the shoulders is this Pose ,Upward Plank Pose. In Dhanurasana , the shoulders were stretched backwards hence tightening them from behind. In this pose as you are seated in Dandasana (Staff Pose) with legs stretched in front of you, place the palms on the floor behind your back at a decent distance between the two arms. As you inhale raise the entire body by placing the feet on the floor and taking the weight of the body on your wrists and shoulders. The only connection to the floor are your feet and your palms while the rest of the body is off the floor and bring the neck and slowly hang it backways and down. Ensure with breathing the entire body weight is spread across and not placed on the elbows and wrists. This opposite bend of the back when compared to the back bend at Dhanurasana works to improve the flexibility of the back. Breathing is considered as the most essential tool to reach the perfection of any asana. A lot of the flexibility of the body is achieved by constant practice of the pose with proper breathing. Here we explain the breathing technique for mastering Dhanurasana. While in Makarasana(Crocodile Pose), breathe a few rounds to relax the spine before we begin to move into the pose. As you inhale, stretch the arms behind you and hold on to the bend legs at the ankles and exhale. Remain here for a few breaths with forehead on the floor. Settle the shoulders well and make sure the body is straight with proper alignment to the mat . Now raise the forehead off the floor and take a deep breathe, stretching the chest, shoulders and upper body upwards and backwards and holding on to the ankles tight. Remain here till the body is balanced well with normal breathing. Once the body is comfortable, begin slow breathing and with every inhalation try and raise the thighs higher with chest and shoulders moving backwards and exhale in the position. The more the breath is slow and steady the more the body will balance well. Try and remain in this pose with eyes closed. After a few seconds or breathe , slowly inhale and while exhaling lower both knees, shoulders and chin towards the ground still holding on to your ankles.Then release the ankles and stretch the legs behind you on the floor and relax the neck completely. Lie down now in complete Makarasana and begin to stretch the entire body back to the floor and relax. Start slow breathing and as you exhale take your mind to the lower back and feel the stress releasing and contract the muscles in and around the spine. You could repeat this pose after relaxing a few breaths till the muscles are contracted completely. Ensure no jerky movements during the pose or while going into the pose.